The Mountain known as Sri Pada Kanda (the mountain of the Sacred Foot Print), Samantha Kutha (the domain of God Saman), Samanala Kanda (Butterfly mountain) and Adam’s Peak located 40 Kilometres North East of Ratnapura is 2,244 metres in height and is Sri Lanka’s fourth highest mountain. Being the main watershed of the island, it is the principle source of four main rivers including the largest; the Mahaweli. The sanctity of the mountain has been held aloft by adherents of Buddhism, Islam, Christianity and Hinduism. According to the Mahavamsa when the Buddha visited Kelaniya on the eighth year of enlightenment, went to this particular mountain on the invitation of God Saman and left his foot print on the Summit. However, it was only from about the 11th Century A. D that the cult of Sri Pada or Sacred Foot print has gained popularity among the Buddhists. Why the summit remained obscure for so long, and why Buddhists did not pay attention to it earlier, cannot be explained with any degree of certainty. The questions such as who covered the ‘Foot Print’ with a larger than life size copy and a concrete slab, and when was it done, also remain unexplained. Nevertheless some Sinhala Buddhist rulers extensively patronized the Foot Print from the time of Vijayabahu I (1070-1110) of Polonnaruwa. The Mahavamsa states that he granted the village called Gilimale (presently in the Kuruvita Korale of the Ratnapura District) for dispensing of gifts to people who trod the difficult road to worship the Foot Print. The Ambagamuva inscription while recording grants of Vijayabahu I, specifically refers to improvements made by him to the platforms of pilgrims on the summit. Nissankamalla (1187-1196) and Parakramabahu II (1236-1270) too went on pilgrimage to Samanthakutha and extended their patronage by grants of lands and villages to the shrine. The increasing interest shown in Sri Pada by Sinhala Buddhists can be gleaned by the Pali text Samanthakutha Vannana written by Ven. Vedeha in the 13th century. It was in or around the 9th century that Samantha Kutha became associated with the first spot on earth where Adams set foot when he was driven out of paradise. 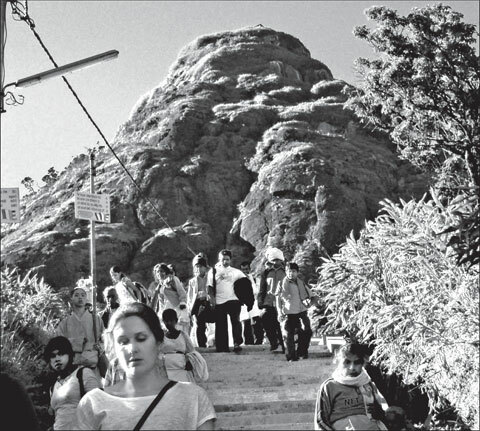 The Muslims who consider Adams as their forefather, popularized the term Adams Peak around this time. The term was used for the very first time by Sulaiman, an Arab trader and explorer who visited Sri Lanka in 850 AD. When Samanthakutha became Adam’s Peak, gem seeking Muslim traders turned out to be pilgrims too and ingratiated themselves to the Sinhalese who were always tolerant in spiritual matters. They could pay homage to the sacred Foot Print and acquire the gems of profitable international circulation on their return. A fragmentary Arabic inscription datable to the thirteenth century which states ‘Muhammed may God Bless him… the Father of Mankind’ has been found in the Bhagava Lena, a cave about 100 feet below the summit of Adam’s Peak. It is written by the side of an earlier Sinhala inscription of Nissankamalla granting land to the Shrine. Both these inscriptions indited in the same cave are testimony to the spirit of religious harmony between Buddhist Sinhalese and the Islamic Muslims. Ibn Batuta on his journeys in Sri Lanka, in 1344 ascended the holy mountain and his itinerary testify to the fact that a considerable number of Muslims had gone on pilgrimage to Adam’s peak during and prior to his time. According to him one of the ten iron chains fixed for ascending the summit was called the ‘chain of the Muslims’. The Italian traveller Marco Polo too has commented on the chains which facilitated the ascent. The Christians also believe that the footprints are in the place where Adams set foot on earth after being exiled from Eden. Father Marignolli who arrived by ship at the port of Perivills (Beruwala) on his way to China in the 14th century states that “when Adams was expelled an angel took him by the arm and set him down…” and he descended at the most famous mountain of Sri Lanka. On the other hand the Hindus consider the Foot Print to be that of God Shiva (Sivan Adipadhan). Roads leading to Adam’s Peak in historical times had been tracks or foothpaths but in and after the twelfth century certain stretches of these roads gradually developed, so that ox wagons and carriages drawn by horses could pass along those stretches. The Mahavamsa attests that there were three pilgrims routes to Samantha Kutha in the reign of Vijayabahu I. The first was through Gilimale and the second, the Rajarata Road, was via Kadaligama, present Kehelgamuwa near Ginigathhena. The third was from Huva or Uva, which was used by pilgrims coming from the Ruhuna region. Certain stretches of these roads were improved from time to time. During the reign of Parakramabahu II, the Minister Devappatiraja improved the road from Gangasiri Pura (Gampola) to Bodhitale or Botale. At Botale he built a bridge of 35 cubits (riyan) in length and proceeded to Kanamadiri Oya, where a bridge of 30 cubuits in length was built at Ulapane. Devappatiraja also built a bridge of 35 cubits in length at Ambagamuva. Some of these roads and bridges were further developed during the era of Gampola and Kandyan Kings. Several of the Kandyan kings such as Vikramabahu, Vimaladharmasuriya, Narendrasinghe, Vijaya Rajasinghe and Kirti Sri Rajasinghe had gone on pilgrimage to Samantakutha and had extended their patronage to the sacred precincts. During this period and after, Sri Pada increasingly became important. Therefore at times the position of the High Priest of Sri Pada was held by most eminent bhikkhus in the island such as Hikkaduwe Sri Sumangala (from 1871 to 1911) and Morontuduwe Sri Dhammananda (from 1954 to 1970). Even in the recent past, the state has patronized the Sri Pada by various donations. Its properties are managed by a lay trustee nominated by the High Priest and under the control of the Public Trustee. Pilgrims from all over the country who visit the Peak during the season; January to April, too contribute in their own way to upkeep the roads and the sacred precincts in a good condition.